Ascension's future will not involve prioritizing its hospital operations, a trend throughout healthcare and one that's lauded by industry experts. As the largest Catholic health system in the country aims to reduce its hospital footprint and trim its leadership structure, it will look for partners that provide care in other settings, such as urgent care, skilled nursing, home health and telemedicine. It will also focus on growing its ancillary businesses, including its revenue-cycle management, group purchasing and investment arms. Many health systems are taking similar approaches as they cope with a vortex of financial headwinds. Consumers are circumventing hospitals to find cheaper outpatient care and have trouble paying on time or at all when they end up in the hospital. Drugs and labor are increasingly more expensive for health systems that are facing lower reimbursement from government payers. Ascension CEO Anthony Tersigni shared these developments and the company's new "strategic direction" via video with his 165,000 employees on March 23, outlining changes including reshuffling management and implementing new staffing models as well as pay cuts, which do not spare Tersigni and executives who report to him. Ascension is offloading hospitals in markets where it does not lead, evidenced by its latest sale of St. Vincent Medical Center in Bridgeport, Conn., to Hartford HealthCare. "There has always been a need for hospitals in our country but not as many as we have today," Tersigni said in an interview. "We don't need to control everything. What we need to do is collectively control the patient experience along the continuum." While he did not specify if more layoffs are coming, these types of announcements are typically followed by staffing reductions, said Juan Morado Jr., of counsel at law firm Benesch. But this shift to outpatient care and a streamlined management model is consistent with the gradual transition taking place across the industry, he said. "The first step is taking a hard look and analyzing what is working in terms of size of facilities," Morado said. "A hospital with 100-plus beds is hard to keep fully staffed and get the appropriate level of care out of them." It is part of an emerging digital wave, he said. "When you look at patients who are immobile, that's where telemedicine will provide a big benefit," Morado said. "It is also a way for Ascension to serve the baby boomers and possibly partner with a long-term care chain." The trend sometimes means bypassing inpatient care. "Some of the innovations we see in care delivery go around the hospital entirely," Chapin White, a senior policy researcher at RAND Corp., said during a recent webinar on healthcare consolidation. "Maybe that is the ideal outcome." Ascension is implementing a systemwide digital strategy, led by a new chief digital officer who will start later this year. 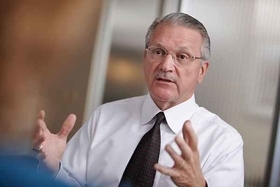 The executive, who is joining Ascension from a major technology company, is tasked with harmonizing clinical practices, unifying the billing system and improving price transparency—something Tersigni admits is not a strength for the system. Disruption will come from outside the industry, so Ascension needs to understand how they think, Tersigni said. "With a system that big, the digital side and back office are where you can add a lot of value," said Tom Scully, partner at the investment firm Welsh, Carson, Anderson & Stowe. "Nothing they are doing is surprising—they are trying to stay ahead of the curve." Part of the new direction involves investing more in ancillary businesses that raked in $150 million in revenue last year. Some of its "solutions" arm includes its group purchasing organization, the Resource Group; its revenue-cycle management business, R1 RCM; its consulting group, Ascension Care Management; its venture capital group, Ascension Ventures; and Ascension Holdings International, which focuses on international investment. Ascension's non-operating gains and investment income have been a bright spot amid industrywide declines in operating income and inpatient volume. Through the first half of Ascension's fiscal 2018, which began June 1, 2017, the system's operating income fell to $84.7 million on revenue of $11.3 billion, a 78% decline from $379.6 million of operating income on revenue of $11.4 billion. Its net non-operating gains more than doubled to $923.2 million over that time. "This move is definitely going to be one to watch as we continue to look at new revenue streams, efficiencies within the healthcare system and how we continue to embrace a more interconnected way of practicing medicine," Morado said.